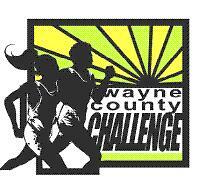 2018 Wayne County Challenge CARPE VIAM! USE THIS REGISTRATION ONLY IF ENTERING EVERY RACE!! 1. Girls Inc – May 12, 2018 @ 8 a.m.
2. Fireworks – June 24, 2017 @ 9 a.m.
3. Run With the Wolves – July 15, 2017 @ 8 a.m.
4. Heartbreak Hill – August 12, 2017 @ 9 a.m.
5. Flying Eagle – September 9, 2017 @ 9 a.m.
6. Fall Foliage 5K/10 – October 14, 2017 @ 9 a.m.
7. Turkey Chase 7K – November 18, 2017 @ 1 p.m.
8. Frostbite 5K – December 2, 2017 @ 5 p.m.